Charlie Munger is an American businessman and lawyer. He is probably best known as the Vice-Chairman of Berkshire Hathaway Corporation and the “business partner” of Warren Buffett. 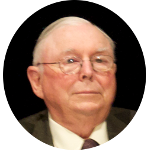 Charlie Munger is also the chairman of the Daily Journal Corporation and the former chairman of Wesco Financial Corporation. Charlie Munger's family tree includes a number of presidential kin including, but not limited to, Warren G. Harding, William Taft, Richard Nixon, Jimmy Carter, and James Madison. He also has kinship to the current royal family through connections to Queen Elizabeth II, Princess Diana, and Catherine Middleton. Celebrity kin for Charlie Munger include Jodie Foster, Kyra Sedgwick, Bill Paxton, and Elizabeth Montgomery. Some historically significant kin include William Ellery (signer of the Declaration of Independence), Julia (Ward) Howe (author of “The Battle Hymn of the Republic”), Robert Townsend (American Revolution spy), and Clara Barton (Founder of the American Red Cross).